Earn points and be rewarded when you hire plant & equipment or engage subcontractors through us. It’s simple – the more you hire, the more you earn. Our PM Rewards system launched on May 26th and has seen hundreds of searchers already reap the benefits. With rewards starting at 100 points, you can work towards a $100 gift voucher all the way to a round the world trip for two! PM Rewards is FREE to sign up and FREE to use. Submit a Quote Request for any of your plant, equipment or subcontractor needs at PlantMiner.com.au or PlantMiner.co.nz. You can also contact us on 1300 550 434 and we’ll find what you need for you. Earn as much as 250 points for every confirmed job hire with a PlantMiner supplier. Check the list down below for the number of points you can get for every job you hire. Redeeming rewards is equally easy. Log in to your PlantMiner account and go to the PM Rewards tab on your profile. 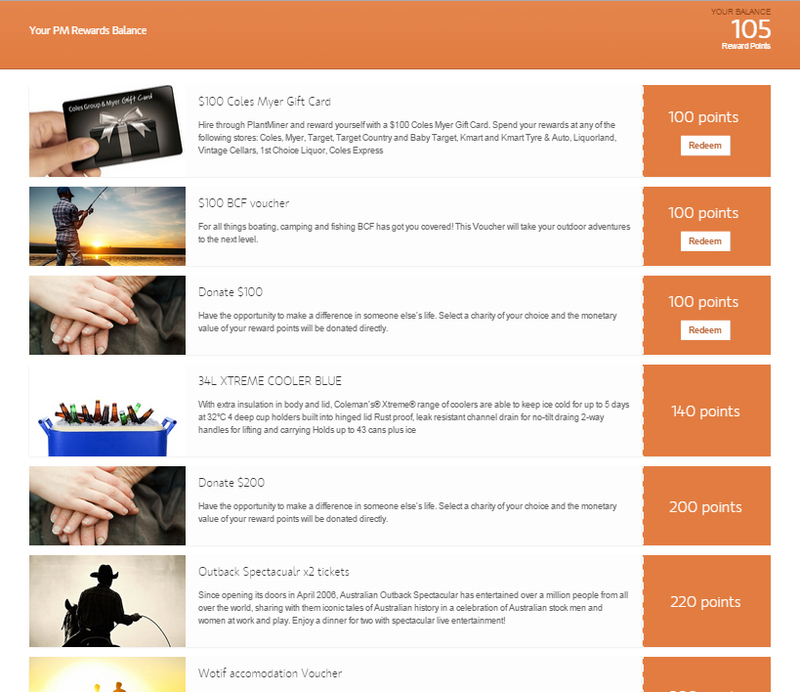 From there, you can view how many points you’ve accumulated on the upper right side of the page. Earn your way to a variety of rewards, whether you redeem a gift voucher or build to an overseas trip! A PlantMiner representative will get in touch with you (via phone or email) to arrange processing and shipping of your reward. Got any questions? You can check out PM Rewards terms and conditions. As Australia’s largest online construction marketplace, we want to reward our 11,000+ happy hirers for their continued loyalty. Submit a request for plant, equipment and subcontractors for hire today and join the hire-way to happiness!